Superb printing by Cartograf of Italy. Detailed instructions with good notes covering colour schemes and stencils depicted. The Hasegawa 1/48 F-2 family of kits are great. These decals will make them superb. 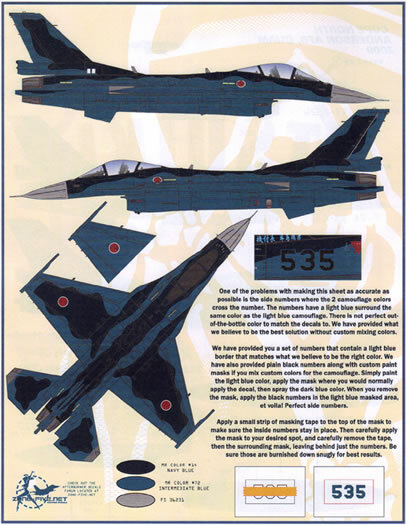 The Mitsubishi F-2 of the Japanese Air Self Defense Force (JASDF) is an interesting aircraft with its genesis in the FSX program of the late 1980s. Back then as I wrote a university thesis on Japanese defense policy and the intricate love hate relationship with the United States, the controversial FSX program was gaining pace with the intent to provide the JASDF with a new generation fighter to replace the indigenous F-1. Originally intended to be a Japanese design drawing on emerging aerospace expertise, the FSX became mired in Alliance politics and trade imbalance along with other factors and ultimately under American pressure a partnership with US industry was chosen as the best route. The end result was a design based on the F-16 Fighting Falcon, with modifications reflecting its low-level and maritime strike role (a new canopy and windscreen) and making use of what is known as the Agile Falcon program, an enlarged and updated F-16 concept with a 25% larger wing which General Dynamics first proposed in the 1980s. Unfortunately the promise of the design has not been fully realized and increasing costs have resulted in orders for the F-2 being reduced to around 94 airframes. 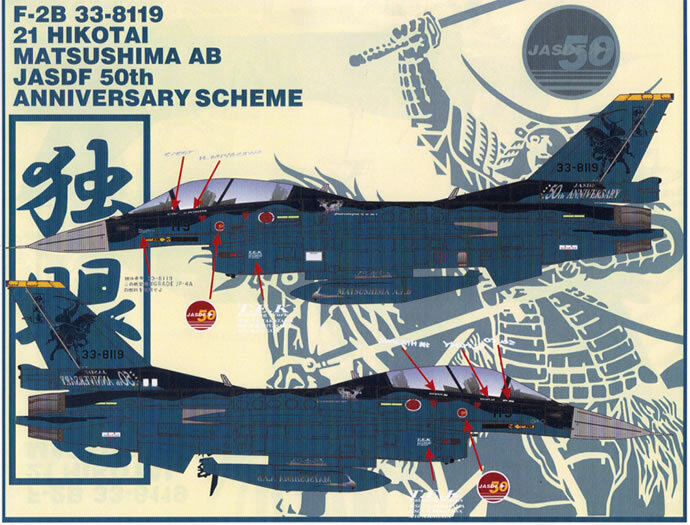 Naturally being a Japanese brand, Hasegawa has produced some excellent kits of the F-2 in both 1/48 and 1/72 scales, with later releases including some interesting anniversary schemes. These kits are very well made and capture the F-2 extremely well out of the box. 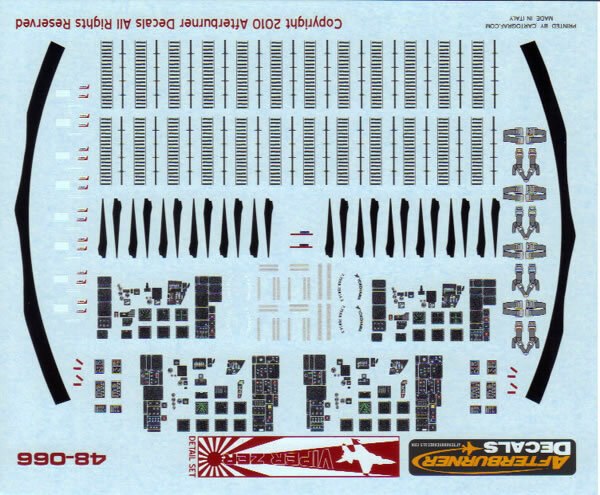 The one weakness is probably the decals, and here is where the Viper Zero series of decals from Afterburner come into their own. 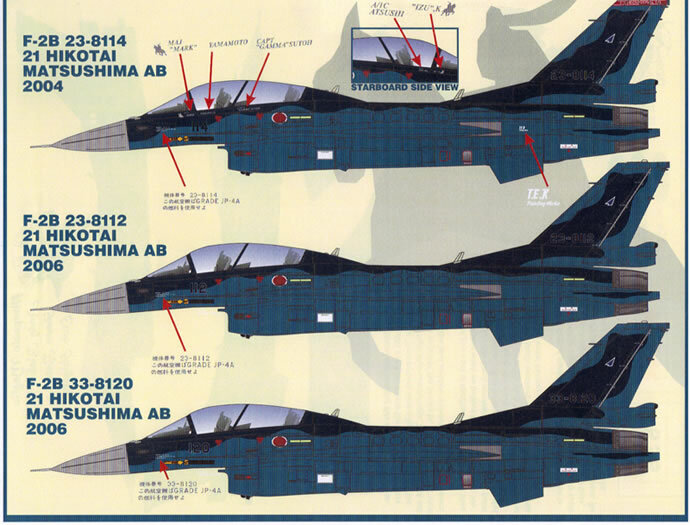 In two sheets Afterburner decals has provided some of the most up to date operational markings for the F-2, all in the striking Japanese maritime scheme of dark and intermediate blue also seen on the F-4 Phantom which the F-2 is partially replacing in JASDF service. 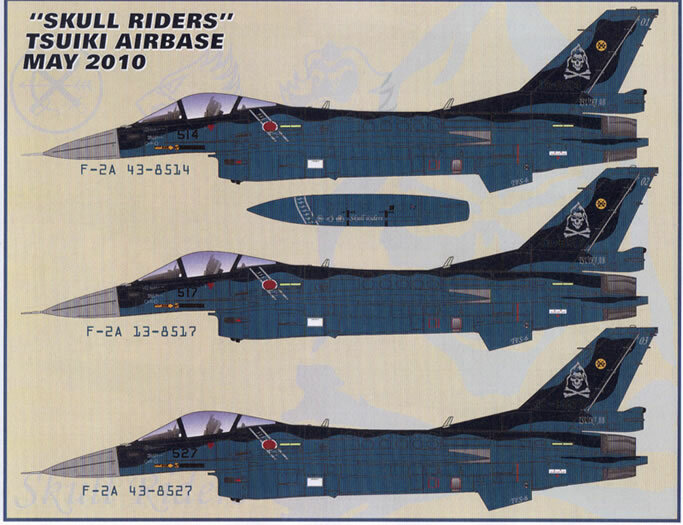 48-064 covers F-2A single seaters and F-2B dual seaters of the 6th Hikotai based at Tusiki Air Base. The majority of these carry striking tail art, including a number of variations of the Grim Reaper. 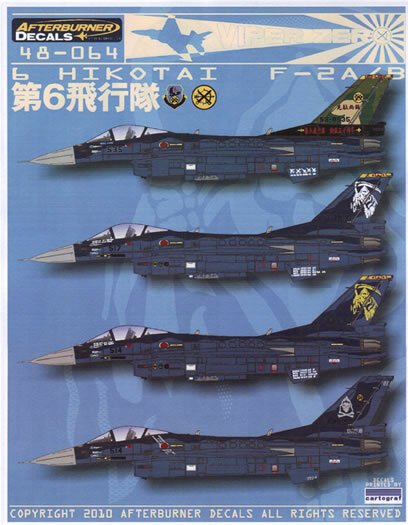 One F-2A is in the 50th Anniversary Scheme of the 6th Hikotai in October 2009, three F-2As cover jets participating in Air Combat Meet 2009, three F-2As cover the 6th Hikotai at Tsuiki AB in 2010 and finally two F-2As and one F-2B are depicted from their deployment to Anderson AFB, Guam for Cope North 2009. 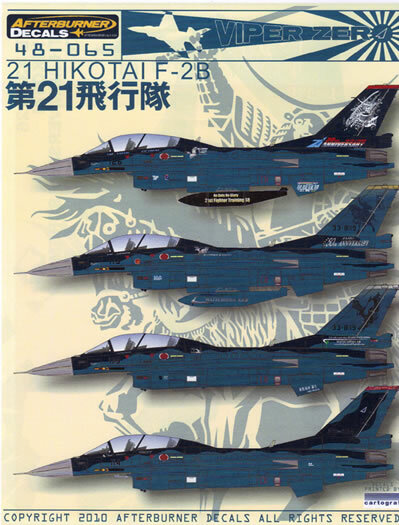 The 21st Hikotai at Matsushima AB are a unit of Air Training Command and act as the training unit for the F-2. As such it is equipped with dual seat F-2B variant. Sheet 48-065 covers both anniversary and line jets of the unit. 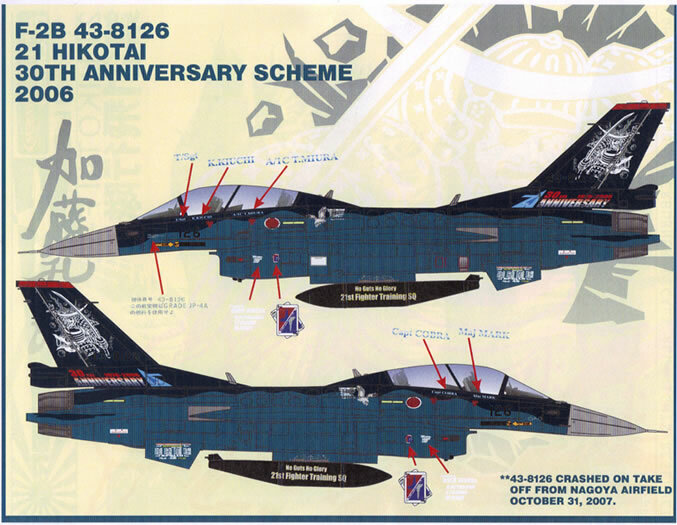 Schemes include the 21st Hikotai 30th Anniversary scheme from 2006, the JASDF 50th Anniversary scheme, and a 2005 Matsushima Commemorative scheme. Also included are two line jets from 2006 and one from 2004. The commemorative schemes are very striking and range from a dramatic Samurai warrior on horseback to a diving eagle design. 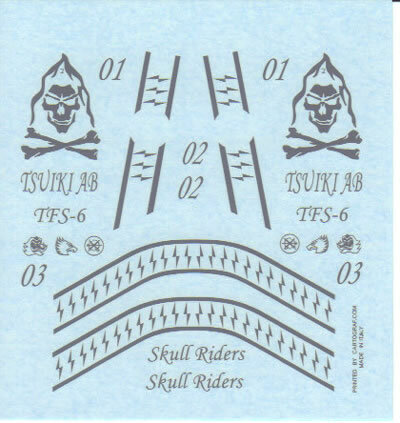 48-066 is the final Viper Zero sheet and an excellent idea. 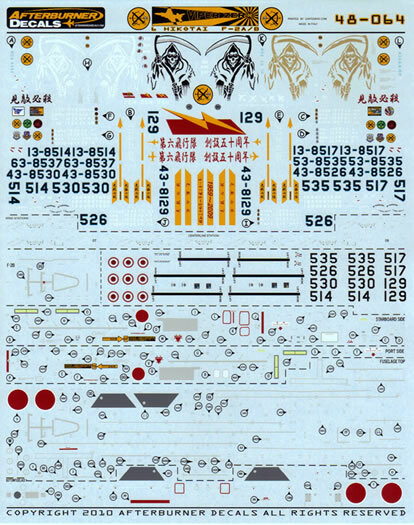 Although both the preceding sheets include complete stenciling for one airframe, they do not give everything. 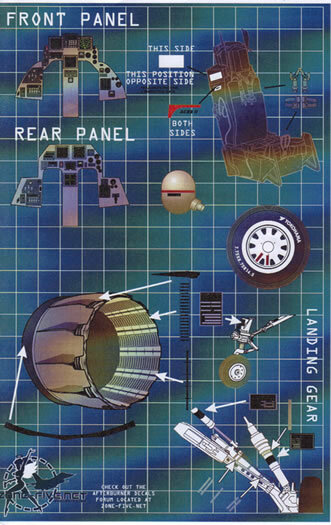 This small sheet is called a detail set and provides two complete sets of control panels for front and rear cockpits, stencils and placards for the ejection seats and undercarriage legs and design effects to dress up the exhaust of the GE F110 engine. A very neat set and an idea that could be very useful applied to other subjects in the Afterburner range. Afterburner always provides detailed instructions and the Viper Zero series is no exception. Each scheme is depicted in full colour four view drawings whilst two pages of instructions cover the maintenance stencils from the sheet. The exact blues of the Japanese maritime scheme are still debated and the only reliable colour matches are available in the difficult to obtain Gunze Mr Colour lacquer series. The serials on the nose of the F-2 are outlined in the lighter underside blue colour were they cross over the darker upper blue. 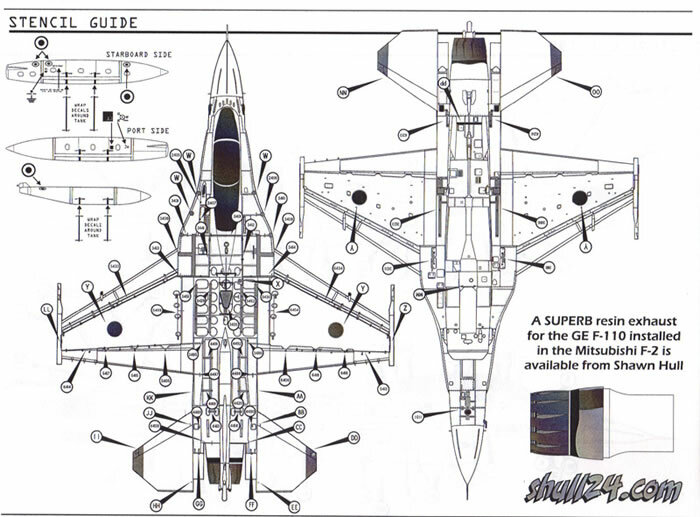 Afterburner gives the modeler two options to depict this. For those with access to the Mr Colour paints, there is a set of serials with the lighter blue printed behind them, colour matched to that brand. For those who choose other paint brands, Afterburner has provided a neat set of masks that allow the lighter colour to be painted instead for use with plain black serials. This is a quality set of decals which cover an interesting aircraft type. 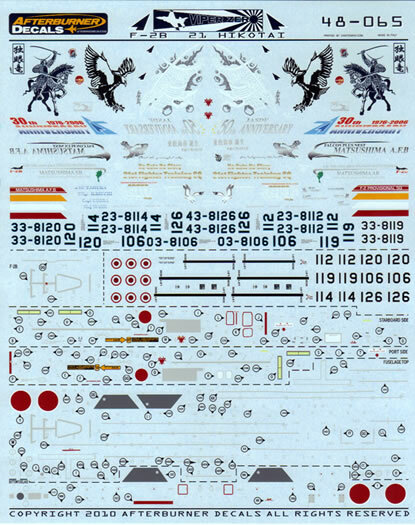 It would be a shame to build the high quality Hasegawa kit and not use these great decals. The extra touch of paint masks for the nose serial numbers shows the attention to detail that Afterburner has paid to ensuring their product is both accurate and useable, something for which they should be congratulated. 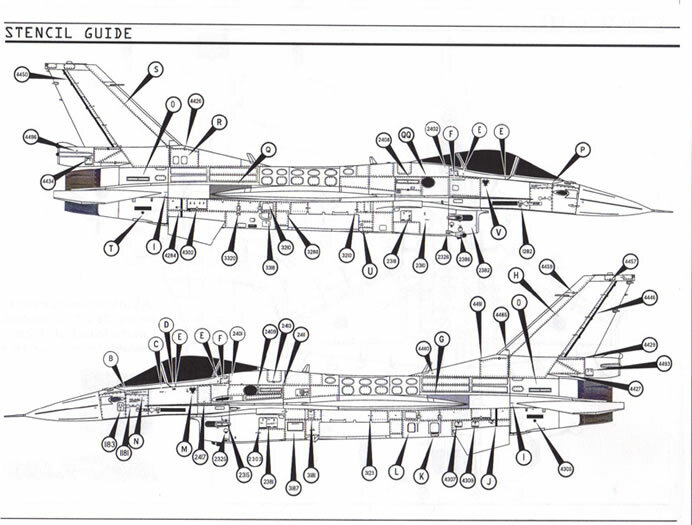 For builders of the F-2, some very useful reference photos may be found at this link.